We’d love your help. Let us know what’s wrong with this preview of Book of Poisons by Serita Stevens. The readers of your crime and mystery stories should be trying to figure out "whodunit"not wondering why your facts don't make sense. If you want to kill off characters with something poisonous, you need to know how a villain would gain access to such a poison, how it would be administered, and what the effects on the victim would be. 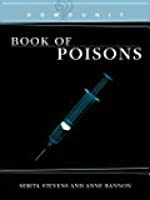 "Book of Poisons" can help you figure out all of the details of proper poisoning. With alphabetical organization and appendices that cross-reference by symptoms, form, administration, and other methods, you'll be able to find the perfect poisons to fit your plot. Plus, a glossary of medical terms makes decoding symptoms and treatments easy for the writer with no medical background. To ask other readers questions about Book of Poisons, please sign up. Great reference, although hubby freaks when he sees it on my desk. It takes a great deal to earn a permanent place on my night stand and this book has done just that! It covers a HUGE range of poisons and gives a thorough explanation of every one, from toxicity level to symptoms to the amount of time before it takes effect. It also has handy indexes for quick lookups of the forms of poison, possible symptoms, time, methods of administration etc. It is a great reference book! This edition also has a new chapter on biological weapons and expanded the chapters on It takes a great deal to earn a permanent place on my night stand and this book has done just that! It covers a HUGE range of poisons and gives a thorough explanation of every one, from toxicity level to symptoms to the amount of time before it takes effect. It also has handy indexes for quick lookups of the forms of poison, possible symptoms, time, methods of administration etc. It is a great reference book! This edition also has a new chapter on biological weapons and expanded the chapters on botanical poisons. I bought this book before I realized I didn't actually want to kill anyone in my current writing project, just drug them for a bit, but it was still an interesting read! This is a wonderful tool/resource book! It's very easy to understand; the symptoms, forms, methods and reactions are cross-referenced so if you are looking for a poison that will turn a person yellow it's easy to find. The book lists acute poisonings (immediate) and not chronic poisoning (slow effect) which is great since quick effect is what most writers need. Neat how the book walks you into a toxicologogist lab and explains WHY it is impossible to get DNA results in 24 hours (like they do on C This is a wonderful tool/resource book! It's very easy to understand; the symptoms, forms, methods and reactions are cross-referenced so if you are looking for a poison that will turn a person yellow it's easy to find. Neat how the book walks you into a toxicologogist lab and explains WHY it is impossible to get DNA results in 24 hours (like they do on CSI shows). Explains why tox screens can only be done on liquids, such as blood. How they use the liver as a milkshake to test for things, etc. A lot of information packed in this 6x8 paperback including changes in medical treatment; explaining if you are writing a book set 10 years of more in the past, syrup of ipecac and gastric lavage may be an appropriate treatment in the ER, but today, that is no longer the case. Very useful for writers and aspiring writers (and probably aspiring killers). Poisons are sorted by several categories so you can find the one you need based on name, or the time until it takes effect, or its deadliness, or search by symptoms, and so on. If possible, an antidote or possible treatment is also listed. This is a wonderful guide for authors who are planning on killing off any characters with a particular poison. 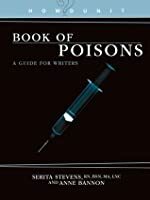 This book goes into detail about various poisons, the ease of access in obtaining them, and everything else that would help to explain why a character would choose a certain poison. Definitely a must-read for authors of suspense and intrigue. Wonderful! While it may be somewhat difficult to understand, it is still a very good reference book. I have been writing about a character who loves to deal with poisons and this book has come in handy to help me understand poisons and how they work. Might I add that it was very interesting to read! I have learned quite a lot reading this book. If you are going to write about poisons or run an RPG with poisons taking a major role, this book is invaluable. Get it now, read it cover to cover, then keep it in your pile when you run or write anything. Another amazing book in the Howdunit series. 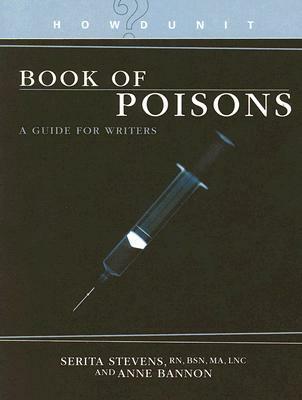 Great all around poison reference book that provides accurate information and save a writer having to go through book after book for ideas to kill off characters. This book like the rest of the series is a must for any crime author. Fascinating reference book for writers. This is a fantastic book, if not very medical. Not for the faint of heart or easily confused, but if you want to kill a character off and use something more subtle than rat poison, this is your book. Full of great information. I just add notes in the margin with more information. Never know exactly what details I'll need until I need them, so if it's not in the book already, it gets added.